The city of Split is the largest city in the Dalmatian region and the second largest city in whole Croatia. It’s considered to be over 1700 years old, making it one of the oldest cities of this area as well. Split is a great connection to other cities and islands of Dalmatia all due to its great location, siting in front of the beautiful blue water of the Adriatic and backed up with impressive mountains. 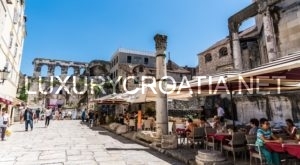 The center of Split is marked with the Roman Palace of the Emperor Diocletian, listed as a UNESCO World Heritage site for being one of the most impressive Roman constructions that is extraordinary preserved. The entire historic city core is on the same UNESCO list from 1979. Diocletian wanted to spend the last years of his life in peace within the walls of his Palace, built near the great Roman city of Salona. The area shows a true coexistence of tradition and modernity, with the palace nesting around numerous cafes and restaurants on Split’s waterfront decorated with beautiful palm trees just next to the sea. Just a few steps into the centre will have you wandering the narrow Mediterranean streets and old city walls through the vivid history of Split. You will see some great examples of the ancient architecture, such as the Peristyle(the main open space of the palace, surrounded with a colonnade of six columns and an arch in the centre), The Cathedral of St. Domnius ( that has a tower for you to climb and gaze at the wonderful sight of Split from the hights), great Romanesque Church and other heritage sites. Another popular sight is the statue of Gregory of Nin, whose big toe has a shiny gold colour, due to all the people rubbing it ( it is said that the wish that you make while doing this will come true). Split’s location on the sea created some of the most beautiful beaches, from the pebble ones to the sandy ones. The most popular may be the sandy Bacvice beach, located closely to the centre and the ferry harbor. It’s a very vibrant beach with low waters, making it ideal for the game of picigin- a game played by the locals that you are sure to see ( and maybe try) if you ever cross this place. The game is even protected as a cultural heritage. A litlle bit to the south, you can find the Znjan beach, an area made up of a number of bays and cafes where you can just relax and have a cup of coffee in the sun. Split has a beautiful forest park area, a hill called Marjan where you can escape the city rush and relax in the forest. Marjan is a great place to engage in some sports activities, a sight-seeing site ( for a number of ancient churches hiding in the trees) and ofcoure, a place where you can find a number of small beaches for a more private vacation. On the south of Marjan hill, there is a pebble beach Kasuni that gives a wonderful view view of the hill once you get into the sea, and just next to it, another beach called Kastelet with small pebble beach stones. Marjan is a great centre for recreation, offering a few tennis courts, footbal fields, an open air gym subtly adapting to the surrounding nature, playgrounds for the kids, marked paths to run or walk and bikes that you can rent and explore the whole hill. 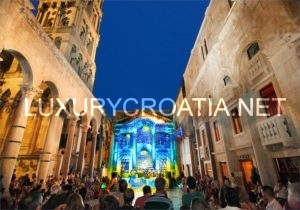 A number of cultural events occur in Split during the summer, such as Film and Theatre Festivals, Olive oil and other exhibitions, The summer of Split, a number of concerts and even the hosting of the major Ultra Europe Festival every year. The food in Split will give an unforgettable experience of the traditional Dalmatian cuisine. To aperitifs such as the Dalmatian herb or grape brandy will be a great introduction to the smoked ham and cheese in tasteful olive oil. Continue to some of the best sea food specialties or roasted lamb, pasticada with gnocci or other traditional meals, followed with some of the famous red wines such as Dingac, Babic, Postup, or white wines such as Posip, Marastina or Grk. To circle the gastronomic experience, give a shot to the sweets like rozata or Dalmatian krostule and your palate will be thankful for your trip to Split. 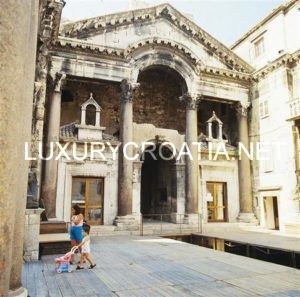 LUXURY CROATIA is trademark of the real estate and travel agency Obiteljska putovanja d.o.o. 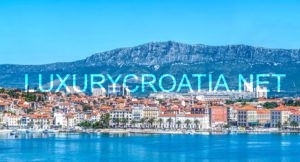 We are a licenced Croatian real estate and travel agency and are registered in the Agency Register of the Croatian Ministry of Economy and Chamber of Commerce under the number 74/2011 for real estate and ID code HR-B-21-060209791 for travel agency. 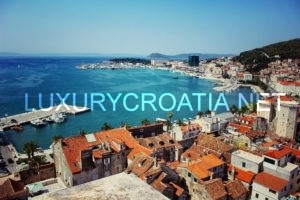 Contact us by email sales@luxurycroatia.net, telephone +385 21 77 9999 or mobile: +385 98 981 39 31 (WhatsApp/Viber). You can also Skype us at: mbdesign05, visit us at our office on address 15.studenog 1991 br 3, Žnjan, 21000 SPLIT , Croatia, or find our representative in your area.